There are two (2) commons types of barcodes 1-D and 2-D. 1-D barcodes are the immediately recognisable series of horizontal lines and spaces that form UPC’s (universal product codes) - the barcodes you’ll find on products that are scanned in a retail environment. 2-D barcodes tend to have more unusual shape and have become more popular in recent years. 2-D barcodes such as QR codes, which are square, can contain much more information when scanned. Their increased capacity to store data, means they can be used in innovative ways, for example a QR code when scanned could link to a deep url on a website for very specific product information. Barcode scanners are one of the most common data input devices for retail businesses. They allow you to quickly and accurately read the barcode on an item, which can then be used by other systems to get important information associated with that barcode, such as the product name, pricing and further product information. They provide a very fast and accurate method of data input at the point of sale, which can then be used by other parallel systems (inventory management, financial reporting etc.) to help run your business. As you can imagine with technology that has been around for over 40 years, there are a large range of different types of barcode scanners suitable for different environments and uses. From the omnidirectional scanners, you have seen in the supermarket to extremely robust industrial scanners designed to withstand drops, water and dust. 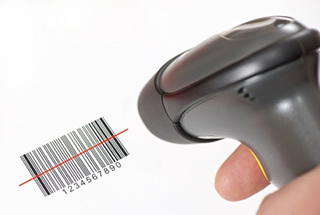 Outside of retail, barcodes are extensively used in industries such as logistics, medicine and asset management where accuracy of data is of paramount importance. More recently there has been a large uptake in the number of portable barcode scanners offering wireless Bluetooth® connectivity. This opens up the opportunity to connect scanners to all sorts of portable computer devices including phones and tablets finally allowing the use of barcoding in more interactive retail environments. Suddenly the ability for a customer service agent to be walking around the store, helping customers and processing sales rather than being glued to a till (or the check-out register) point becomes possible.